Sometimes it seems a bit like sacrilege to mess with a classic dish like potato salad. Everyone has their favourite varieties – some like theirs minty, others like good chunks of egg in there. Most agree it’s got to be creamy and cooling, with enough crunchy things in there to keep life interesting. But let’s not beat around the bush: potatoes are the star of the show here! As long as there are potatoes, and the potatoes are quality (as of course ours are, nothing beats an organic potato for flavour! 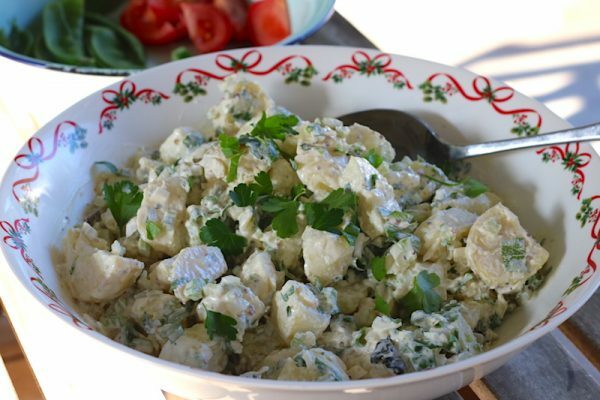 ), I think you can be forgiven a little potato salad upgrade. In this version we’ve swapped out the regular bitey dijon or sweet yellow mustard in the creamy mayo-based dressing for wholegrain, and your regular mint for a bunch of garden-fresh mixed herbs. Just as good but a bit different to change things up somewhat. You never know, it might just be your new favourite. Place the potato pieces in a large pot and fill with cold salted water to just above the level of potatoes. Boil potatoes 15-20 minutes until soft but still holding their shape. Drain and leave to cool. In a serving bowl, Mix together the mayonnaise, sour cream, vinegar, mustard, sugar, and salt and pepper to taste. Add the potatoes, dill pickles, celery and onion and mix to combine. Leave for at least an hour for the flavours to mingle. The salad is best served chilled but not too cold - you need the flavours to be vibrant, and coldness can inhibit that. If it's been stored in the fridge I like to bring it out about half an hour or 45 minutes before eating to let it come to room temperature just a little.